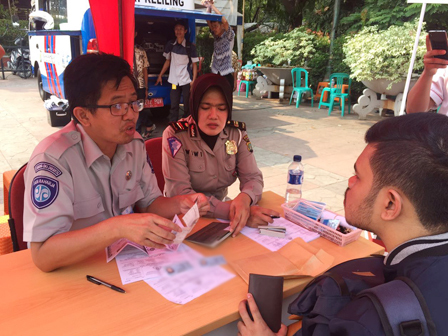 At Car Free Day (HBKB) event on this Sunday (8/13), many taxpayers came to Motor Vehicle Tax (PKB) service booth on Jl. MH. Thamrin.
" It is increased by around 83.78 percent than the same week before the act"
Jakarta Taxation and Local Retribution Agency (BPRD) Head, Edi Sumantri said, since Jakarta Provincial Government and Ditlantas Polda Metro Jaya have stated to act deliquent taxpayers, the number of vehicle tax administration is increasing. "Today, we have 57 transactions at our service booth during HBKB. It is increased by around 83.78 percent than the same week before the act," he said. He explained, particularly at HBKB, his side makes the administration easier by not requiring taxpayers to bring BPKB copy. "We have this policy just for our booth at HBKB to accelerate and facilitate our service for tax payers," he closed.